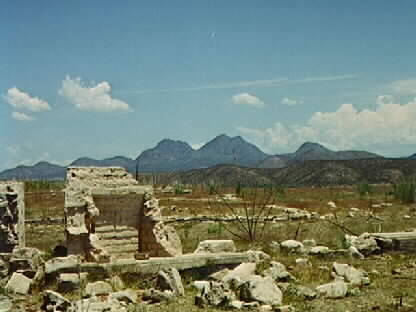 This is a view of some of the ruins of "Old San Carlos." This was the original location of the San Carlos Agency. It is supposed to be under the waters of San Carlos Lake, but in this dry year (1997) the lake has lowered so much that some of the old buildings are clearly discernible. Some of the remains here date back to the 1880s. When Coolidge Dam was completed in 1930 many of the building blocks were moved to "New San Carlos," further up the San Carlos River. The original Old San Carlos graveyard was covered with a large slab of cement. The Apache name for Old San Carlos was Ni' Téégochi, meaning "bare land extending to the river" (more or less). So much history transpired in this area it is hard to imagine. Geronimo and his people often visited this old agency. It was here Al Sieber was crippled in the gunfight that led to the arrest and trial of the Apache Kid. The place is full of "ghosts." This is another view of Old San Carlos. 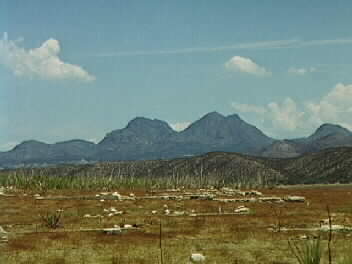 Mount Triplets is clearly seen in the background. Old photographs, taken of the U.S. Cavalry, etc., have nearly the identical view of Triplets.